We’re continuing to explore the passages in Genesis about Jacob and his dysfunctional family. In a way, Jacob is between a rock and a hard place. He’s heading back to the land of his father, where he fears an encounter with his brother. We’ll hear more about that next week. But he’s also being pursued by his father-in-law, Laban. Today, in our text, they have their final encounter. It’s a long passage and I’m not going to read it all, but I want you to gain an understanding of this encounter and the skillful tactics of storytelling we find in Genesis. The narrator doesn’t let us just think this is between two men. God is involved. God’s in the background, protecting Jacob. And, we also see that Laban, as crooked as he can be, has a heart. There’s a human side to him. As this is a long passage, turn to Genesis 31. It goes from verse 22 through the end of the chapter, 30-some verses. But I will only read the first few verses, then move on to verse 43 and read the ending. I’ll fill in what happened in the sermon, but you might also take this as a homework assignment to read this afternoon! Read Genesis 31:22-25, 43-55. You know, as a pastor I have found out that I am either the last to know about something or I know way too much about things I don’t necessarily want to know. In other words, no one tells me what’s happening or I’m told things I’d just as soon not hear. With that said, let me tell you about this guy from Hastings Michigan. We’ll call him Jimmy, not his real name. For someone in real estate, he had a bad reputation. Lots of people told stories about how he’d cheated them out of this or that. There was a list of those with grievances, including the IRS. To say the least, Jimmy wasn’t liked by many if not most people. 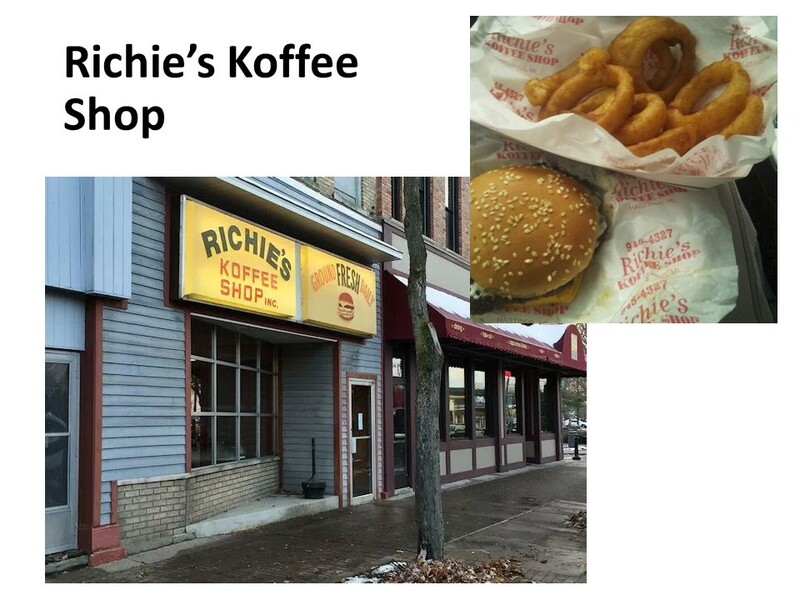 I was in Richies Koffee Shop one Saturday morning. Richies is a classic greasy spoon diner. Their coffee is good even if it’s spelled it with a K. They even know how to poach eggs and place them over corn beef hash, they can make a decent omelet, and there burgers were something to savor. But it was there onion rings that were too die for. And if you ate too many of them, you probably would. This particular Saturday morning, I sat at corner booth as I was editing my sermon. I had seldom seen Jimmy in the place, but this morning he was sitting at the long table in the center of the backroom. This was the township informal court. It’s the place you wanted to sit if you wanted to know all the scoop on what was happening in town. And if they didn’t know what was happening someone would make it up. This gathering place was as much as a rumor mill as it was a breakfast table. People in the community rotated in and out from this table throughout the morning. Once Jimmy got up and left to pay his bill, the guys at the table (and they were mostly but not all men) turned their sarcasm toward him. “Who allowed him in here?” one asked. That’s not exactly what he said. I eliminated some of his more colorful modifiers that would not be appropriate in a sermon. One after another at the table made disparaging remarks about Jimmy. It was as if a quarterback was sacked and the opposing team piled on. I was feeling uncomfortable with what I was hearing. I thought I should say something, but wasn’t sure what, nor did I want them to think I was listening in to their conversation (not that they were trying to shield their talk from anyone). Thankfully, one of the waitresses spoke up and berated the table for their attitude. Then they began to talk about her. I had done some business with Jimmy, and I admit that I had watched my back. But I got to like him. I realized he had a good heart. I think he was also lonely. Outside his wife, he didn’t seem to have many friends. But then, as he started to come to church and to get involved, he began to make friends. And I knew that before he’d left the area to be closer to family, he made some incredibly generous donations to the church and community. Not all of these donations were known even to those being helped. Laban reminds me of Jimmy. By the time we’re at today’s passage, he’s old. Two of his daughters have run off with their husband. For two decades, he’s been trying to get what he could from his son-in-law, Jacob. And while he’s away from home, Jacob and his family saddles up and heads west. We’re told they’ve been gone three days when Laban gets the word of their departure. Perhaps he was out at the far pastures, three days travel away, where he’s sent spotted and black sheep and goats. The man was always trying to get the best of Jacob, but God saw to it that Jacob prospered as Laban’s ewes and nannies produced more spotted and black lambs and kids, those that Laban had promised to Jacob. Hearing that Jacob and company had left, Laban gathers everyone up and they began their pursuit. They catch up with Jacob at Gilead, after seven days of hard riding. There is a problem of understanding here as it would have been impossible to have made it from where Laban was thought to have resided to Gilead. It’s possible he’s from another place, that’s closer. We’re told that God informs Laban in a dream that he had better go easy on Jacob. When Laban catches Jacob, he claims the flocks and his daughters and their children belong to him, but he doesn’t ask for them back. He acknowledges that Jacob’s God has spoken to him. Jacob is protected, even though Laban supposedly has more men to fight and, from appearances, could easily take back what is his. So instead of asking for his daughters or livestock (which he’d already given to Jacob) back, he asks for his household gods to be returned. This is interesting that he wants these gods, for he’s already acknowledged that superiority of Jacob’s God. 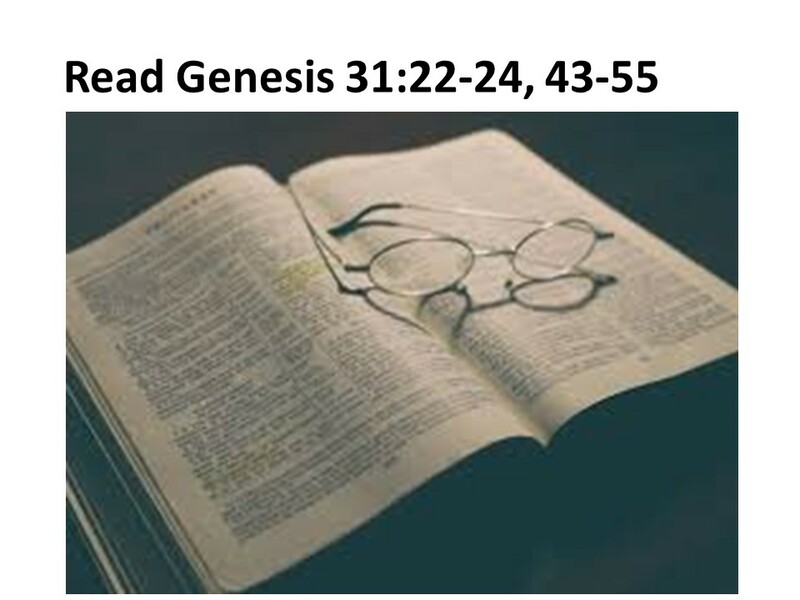 Last week, I told you how this section of Genesis reads like a television sitcom, with each episode laying out something that will have to be resolved in future episode. And we learned that Rachel, Laban’s beloved and beautiful younger daughter whom Jacob cherished, had stolen the idols belonging to her father. Perhaps Rachel felt she needed the luck these idols might bring. After all, even though she is the apple in Jacob’s eye, she has to deal with her older sister Leah, who’s been able to give Jacob four sons. At this point, Rachel has only given him one son, Joseph. Not knowing that Rachel has stolen the gods, Jacob pronounces a death sentence on anyone found with them. The listener to this story would have been on the edge of their seat, in suspense. If the idols are discovered with Rachel, she’s a goner, and both men would have grieved. Laban storms through the camp, in a humorous fashion, trying to find his household gods. He comes up empty. Rachel hides them by sitting on them. Because it is “that time of the month” for her, her father doesn’t check everywhere. When Laban comes back having not found his idols, it’s Jacob turn to be angry. He berates his father-in-law for the abuse he’s experienced over the past two decades. Laban then suggests that they make a covenant with each other. They gathered stones and built a monument as a reminder. Laban shows concern for his daughters, as he acknowledges that he’s not going to be there for them, so he ask God to watch over them. But there is a sadness in his words, for he realizes that he won’t be there to protect them. Jacob points to the stone as a boundary marker between the two families. They both agree to the covenant. Jacob then offers a sacrifice and everyone eats and has a big party. Early the next morning, Laban kisses and blesses his daughters and grandchildren and returns to his home. Jacob is now free to move on to Canaan, to his father’s home. One chapter is closed, another is about to open. What does this passage mean? Don’t steal your daddy’s gods? Certainly, one level, it does show how our deeds follow us. A couple of chapters later, God, whom Jacob refers to as the “Fear of Isaac”, calls on Jacob and his family to cleanse themselves of all idols and these gods that Rachel hoarded would have been discarded. But then, too much water had been under the bridge for them to be return. By calling God “the Fear”, the story pulls us back into the era of the patriarchs. They didn’t have theologians to write about God. They didn’t even know as Moses did, who asked of God’s name and was told, “I am who I am.” And they certainly did not know God as we do, though the lens of Jesus Christ. “The Fear” is a good way to acknowledge this mysterious deity that spoke to Abraham, Isaac, and Jacob through dreams and visions. With the trust of Jacob, who listened to “the Fear”, we should listen and be in awe of our God. A second thing we might take from this passage is the need for boundaries. When there’s conflict, it’s good for people to come together in a covenant, to set boundaries, and to move on with their lives with no hard feelings toward the other. Laban is free to go on with his life, having trusted his daughter’s to Jacob’s care, under God’s eyes. Jacob is free to go to his father’s land. In the end, instead of trying to get the best of one another, forgiving and moving on is better for all involved. And with such a parting, each party leaving it up to God to watch out over the other is an important lesson. A third point is that both men call on the God of their father. I don’t want to go too deep here, but maybe this text shows us how we can work with those who have different ideas about god. 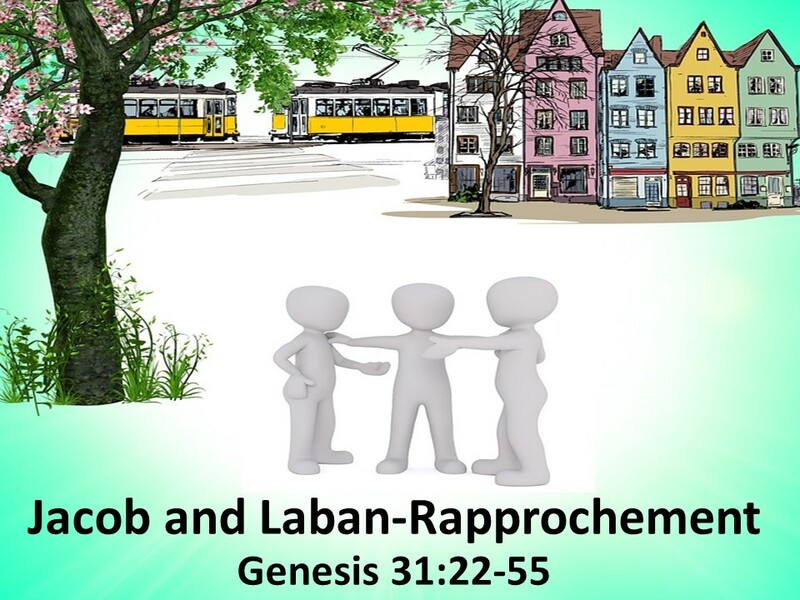 As we’ve seen, Laban’s idea of god is not the same as Jacob’s. Each, holding on to their own beliefs, looks to their deity to hold them to the covenant. Finally, we must realize as Laban did, that we are not able to control everything. God is in control and we must trust, as those in recovery say, in a higher power. We place such trust in the triune God, we can sleep better at night. Amen. Frederick Buechner, in his novel about Jacob, Son of Laughter, uses Fear whenever he has Jacob referring to God.